Great answers JT, I never knew you were so much of a geek.! I’ve realised that scorewhoring was too frustrating and that games should be played for enjoyment only. Sensible Soccer has never been surpassed as far as footy games go! Do you get crap like this for your Birthday? I saw one of those mugs in town today. I was duly disappointed. Think how JT felt on his birthday!! What do I buy for this year in the workplace "Secret Santa" debacle? Will keep you posted on the spectacular reaction it receives come Christmas Party time. If anything it'll quietly amuse me, at the least. Go for it, at least my mug has meant I can have proper tasting tea at work, rather than from the horrible metal cup they issue us with! You have metal cups? That's creepy! 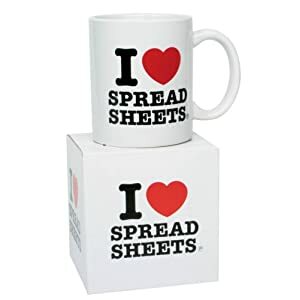 In fairness, that spreadsheet cup looks pretty big. All hot drinks are better when twice the size. If it's not big enough to warrant two tea bags, it's just not worth it. "Aim low. Achieve your goals. Avoid disappointment." It appealed to the cynic in me at least.